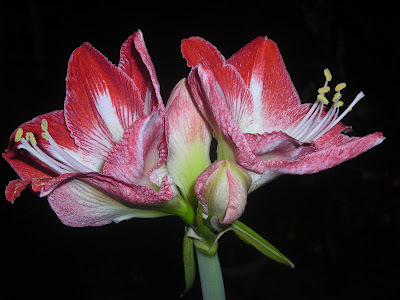 We, too, force amaryllis for the Christmas holiday. There is some so majestic and proud about the way the flowers hold themselves. Yours is a beautiful color. Thank you for stopping by my blog this morning. It's always nice to "meet" fellow bloggers and it's the highlight of my day when that happens. Amaryllis and anything garden related intimidates me. Yours are beautiful! I wish I had that talent! I've spent the better part of the evening perusing your blog. My! How time flies! I love your home. It is absolutely gorgeous...because of your decorating. I have also drooled over the photos of the food you have prepared.